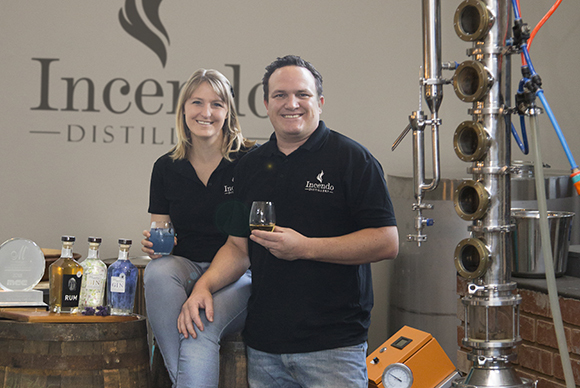 Incendo Distillery was founded by myself, Francois Joubert and my wife Vonmari Joubert. My fascination with distilling started with the only job I was ever “fired” from. I was 14 years old, and picking peaches on a farm of a friend. Unfortunately my colour blindness meant lots of green peaches, and not many ripe ones… The following day I was recruited to help distill Mampoer in an age old copper kettle – in an effort to protect the orchards from my picking ‘skills’. In 2010 I bought my first 25Liter alembic still, with a 100L Fractionating collumn still following in 2013. And since then I’ve perfected my recipes, now itching to share my creations and passion with the world! 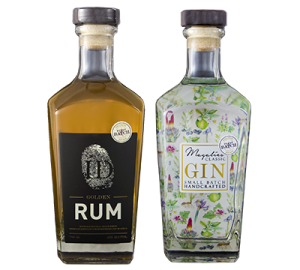 Vonmari’s maiden name is Stoker – hailing from her great grandfather Hendrik Stoker who was a ‘jenever stoker’ (Gin distiller) in Assen, Netherlands at the turn of the 18th century. She is eagerly working on a ‘heritage’ product range in remembrance of her family lineage. Vonmari is also responsible for all the branding and marketing materials of Incendo Distillery. At Incendo Distillery it is our mission to provide you with new experiences, interesting tastes. If you walk out after a distillery tour and tasting without your horizons broadened – we have failed. You’ll find different gin’s, rums and whiskey in our distillery. We experiment with different grains like Rye, Barley, Triticale and Wheat. In as far as possible we use locally sourced ingredients for our products. And most important – we don’t waste. Process water is recirculated. Spent grains are used for baking dog treats, animal feed or composting. Every single bottle we produce will be part of a small, unique and handcrafted batch. You won’t find mechanical production lines. We won’t take any shortcuts – such as buying in gin concentrates and merely ‘flavouring’ them. A lot of time and planning go into every batch we make from milling our own grains, harvesting our own yeast, fermenting, distilling, ageing and enhancing our spirits. We promise you an intense experience! So, what’s with the name ‘Incendo’? These terms all describe what we do – taking ordinary ingredients, enhancing them by using fire. And intensifying them by using oak and time.